As I waited for the book to arrive (after sending in my $29 bucks by the way) I was bugged by the notion that maybe I'm not the guy who should be reviewing this thing. I'm certainly no expert on self-infliction or the more 'gross' aspects of the sideshow scene even. In fact, I'm the guy who extols the 'family' aspects of the biz and to be honest find it hard to watch the pin cushions work. . . I never wanted to be a human pin cushion, no one on the planet has more aversions to needles than I, so I didn't need to dream of them! On the other hand, my favorite writer is Daniel Mannix and what the heck I've seen enough ten-in-ones so I should be able to handle it . . .right? I love the fire acts and the sword swallowing and, of course, the entire show biz arena it flourishes in . . . and then there was the time I met Tim Cridland (The Torture King), while I found it hard to watch his routine, I found him to be a profoundly human . . . just a nice guy who happened to skewer himself under hot lights. But, this book wasn't just about Tim, this was the story of the notorious "Jim Rose Circus Sideshow,": shock, revulsion, fainting and hurling for a degenerate crowd of jaded rockers, right? August 27 and the book is here. It's big, too . . . hmmm. 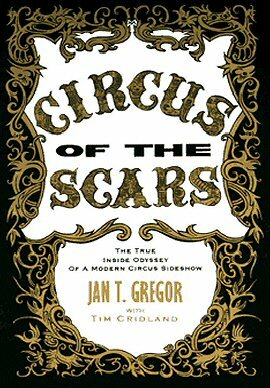 "The Circus of the Scars", Jan T. Gregor with Tim Cridland. Note: For those readers not familiar with Rose and his exploits, do a Google search if required-but after the huge Lollapalooza rock tour, numerous TV and print appearances is there anyone who hasn't heard of Jim Rose? Also, I understand the book is not authorized by Mr. Rose. It will be interesting to see his reaction to the inside story being told in such a matter of fact way, without the hoopla and the make-up. In Jim Rose, we have a 90's version of old P.T. with some Nitro thrown in the mix (and isn't the 'tick, tick, tick' all part of the excitement anyway?). This is the story of a road trip and beyond. Of a troupe of skilled performers and way beyond. Repulsive routines engineered to make the weak hearts faint and vomit-not really true circus folks' you may be thinking? Whoa-slow down says I! . . .These folks out of Seattle deserve a slower take. Here are assorted skills and egos all bottled up with lightning crackling at every turn, yet each fits in to the whole with no one above the rest, a group of space gypsies on a road of one-nighters, infrequent showers and the ever present danger of risky demanding acts. Not real circus? It is all detailed to the nth degree by one who was there for every step and misstep. As the cover blurb says, it's . . . 'The true inside odyssey of a modern circus sideshow' . . . oh, yeah. First off, let me let the author off the hook. The first 165 pages went by like a pamphlet. I was at that mark before I even looked up to check the clock, three hours. "Circus of the Scars" took Mr. Gregor four years to get it all down, all 450 pages of it. As the road manager for the original Jim Rose troupe, somewhere along that road, this guy learned how to write. While I expected to me "shocked and appalled" I was "moved and enthralled." Between the lines this is the story of us all. We who are dedicated and starry-eyed and filled with wonder. Though the stage deeds are beyond my understanding (drinking 'bile beer' is particularly beyond my reach) true love of the game is what moves us all to create a world away from the world, under the Big Top. "The circus is a jealous wench. Indeed that is an understatement. And who will allow no private life to those who serve her. Destroying the happiness of their loved ones by her insatiable demands. I love her as I love nothing else on earth." "The truth was stranger than any fiction. What you are about to read is true. The names have not been changed; there are no innocents." Mr. Gregor, I beg to differ. This ragtag bunch, striving for recognition, bleeding (literally) and clawing for adoration and respect, enduring the road trips from hell and above all, above all, delivering the goods to the audience as all true performers should, are eventually shown to be naught but innocents! In "Circus of the Scars" we read about some pretty outrageous behavior but most of that has to do with the lengths these artists have to go through to entertain a modern, burned-out audience. The Slug-Mr. Lifto-'Torch' (Cridland's nickname, derived from Torture King)-Bebe-Dolly-Matt the Tube and, of course, the driving force of nature, an ubiquitous explosion of energy (and genius?) Jim Rose. I'm not going to tell you about the story points or about how these circus people made their living, or what they had to experience to become world-renowned. In a way it's our story too, some of us have been there, we know what these words mean and portray. I suppose my job here as I see it is to rid any notions this is just another book about freaks and pitch card prose. And I ask you to drop any trepidations you may have in wanting to read about folks who turn themselves into man-made freaks and take piercing into a new dimension among other creepy things-but Jan Gregor has the skill, the understanding of other sensibilities to write for 'us' too, not just the reader after the cheap thrill. It's a circus story, though a circus like no other, still an age-old tale of comrades in arms. I had intended to write a complete review in the normal fashion of such things-read the book-do some quotes-reveal the story-praise the prose-blah, blah, blah. But I think in this case my opinion of the goings-on between these covers wouldn't amount to a hill of beans. "Circus of the Scars" will hit each one of you differently-on a personal level. Some will be repelled and not give it time to work a little magic-others will revel in gossipy details, ect. Me? I'm taking away from this book some insight into the workings of friendship under duress-just folks, caught up in the whirlwind of life and circus. There are big laughs and interrupting errors and enough lunatic shenanigans to fill three books. There is rare personal peeking going on here and in the case of this group of characters definitely worth the peak. These are not the usual shallow, brain-dead celebrities we are daily exposed to out in Hollywood and in the tabs-here, we look underneath and find the true passion of true performers willing to lay it on the line for their craft. So, you're just gonna have to order it and enjoy it for yourself and experience the joys and horrors of the modern road show. There will be another review crediting the excellent design and art of Ashleigh Talbot as well as highlight some personal observations and knowledge of the principles involved. Since this is a limited press run I suggest you get yours a.s.a.p. it's always nice to have a first edition. One more thing: the author credits Tim Cridland's participation thus, "with the shared memories, research and insight of Tim "Zamora the Torture King" Cridland." No book (or video for that matter will ever convey Cridland's act to the uninitiated. He remains (to steal a term from pro wrestling) "the best there is-the best there was-the best there ever will be." I understand from my friend Chuck Burnes that Tim will be performing a version of his incredible act during Knott's Scary Farm bash this October. I mention this because sometimes after a performance Tim likes to cut up jackpots in his own very quiet way. If you read the book, you'll have more to talk about. "Circus of the Scars" is published by Brennan Dalsgard Publishers, Seattle, WA. Hardbound w/photos and an excellent bibliography (worth the price of admission). A signed deluxe edition is available as well. Update: march 3. 2005: Circus Of The Scars remains the best book I ever read. Copyright 2005 BDP All rights reserved Image used with permission of BDP. Reproduction or use of the text or images in any form are prohibited without the written permission of Sideshow World or their respective authors. For further information. drop us a line.